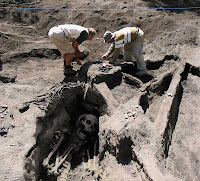 The Nephilim or "Watchers", the Anunnaki, The Giant Anakim, The Elohim, The Neter, the Cainites, the Tritons, the Titans, the Cabiri, the Cimbri or Cimmerians. These are names that have been given to the giants that roamed the earth. They are mention in almost every ancient text from every corner of the earth, and yes in the Bible too. I'm fascinated by th e thought of these giants because these beings as you must realize "came from the sky". OK? That means that they are extra-terrestrial, or as I like to call them, alien. It's funny how so many different story's from the past put together the mystery of where we came from and they all include giants from the people that "came from the sky". 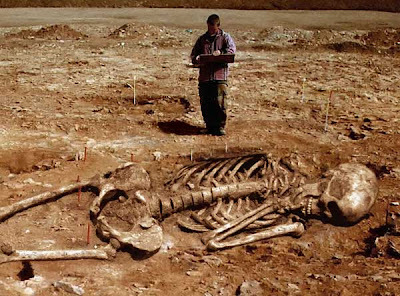 I have come to the conclusion that these giants were part alien and part human. Think gene splicing would be difficult for such an advanced race? We can't even put humans on mars yet and were already doing it. 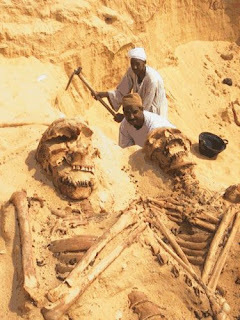 These giants were made in order to rule the human race while doing the bidding of the alien race such as mining for gold. Some people feel that these aliens were considered to be the reptilians, and maybe they were. 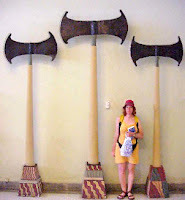 Either way it would make sense to me, to make giants rule over humans because of the intimidation that there presence would of had, and humans would have no explanation for there size except for they must have been "Gods". 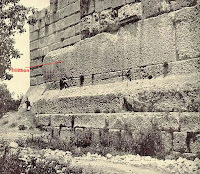 Then there is the theory that these giants were first slaves to the reptilians, and it was the giants who built the great structures of the earth such as Baalbek or the pyramids of Egypt. When you really look close at these structures and how they were made, it still baffles scientist today. There is really no true explications of how it was done, only theory's which still come up half short. Let's take for example the city of Baalbek located in the eastern part of where mod ern day Lebanon is. First off there is no story's, folklore's, tales or for that matter any kind of literary records of the way these structures were built. Not by the Romans, not by anybody. The stones used at the base of the construction are the largest megaliths on the planet. Weighing up to 450 tons!!! Whats even more crazy than t hat is the rock quarry from where these stones came from located a quarter mile DOWNHILL I might add from Baalbek. There is a single cut limestone that's 69'X16'X13'10" weighing at a wopping1200 tons still connected the the rock as if it was ready to get cut off and brought back to the site. There is no evidence containing any kind of equipment use in that day that would move these giant stones. Besides, the path between the quarry and Baalbek was uphill over very winding rough terrain and no evidence whatsoever that there was any kind a of flat hauling surface. Even with today's technology it would be an incredible task. Contemporary scientists, engineers and archaeologists alike don't understand how this even could be done with today's modern technology. Then the fact about how these stone were placed so precisely is just mind boggling, along with the fact of where the stones were placed there is no conceivable place where huge pulleys could have been stationed. So let me try to swallow this for a moment, the smartest people who have studied Baalbek from all over the world can NOT explain how it was done or how it would even be constructed today? With help from the Aliens of course!! Big stones and big people to move them. Yo u know, it's imposable truly decipher what really happened in the beginning. All we have is what was left behind. Not to say that the truth isn't out there. I believe that it is, but if the truth got out it, would change humanity forever. Some people don't want that to happen and will do what ever it takes to keep it that way. That's why were made to figure it out for ourselves. But I also believe that some day the truth will come out and were not to far from that day. There is to mu ch information for it not to, it's only a matter of time. Can't you just picture Obama making a formal announcement about how the aliens made humans from their DNA and that the history books are now going to be rewritten of what really happened. I guess they'd call that book "The Truth Of Human Kind" Do yourself a favor and click, "ancient giants", it's a Google search. As you will see there is so much evidence and knowledge on the subject it's truly mind blowing. 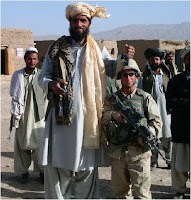 Were these giant's real??? Yes, they were and not only were they very real, there are plenty of skeletal remains proving it. Unfortunately, there have been faked photographs circulating the internet that are debunking the fact that these giants were real. It's to bad that people are so willing to pass something off as non-sense because of a few well made photo's. There's nothing about this subject that is non-s ense. These picture's that I have posted are real, and are not the some works of a crafty graphic artist. Take a look at these pictures of giants from the last 150 years. 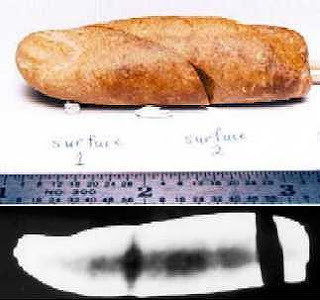 The DNA of these humans is not some freak of nature, but a DNA code constructed in an alien lab thousands and maybe even millions of years ago. Sounds crazy, but it may be not to far off from the truth. In fact it might be a spot on piece to the puzzle. The only reason this scenario may sound off the wall, is because everything we have been taught and know tell us this could not be true. 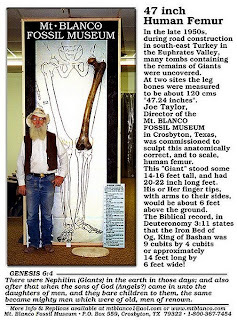 In many of these story's of the people that "came from the sky" who made these giant's of the earth, proclaim that they had six fingers and six toes. There are statues all over the world depicting giants gods with six fingers and six toes. "And there was yet a battle in Gath, where was a man of great stature, that had on every hand six fingers, and on every foot six toes, four and twenty in number; and he also was born to the giant." Now get this, modern day giants from the last 150 years are known to have six fingers and six toes, and app arently it' s very co mmon for giants to have this birth defect. Or is it a defect at all? I don't think so, for me this is clad proof that this ancient giant alien DNA has been past down from one generation to the next. This makes sense, how could it not, the evidence is right there. Now all you have to do is open your mind and allow these thoughts to become real. The truth is out there and I feel this is a big part of it. It's funny how the modern day giant is labeled as a freak of nature, but the ancient giants were gods. Fact is, this is not to be denied and way to important to overlook. Seek the truth, don't remain a prisoner to the mind THEY want you to have and attain your own attainable mind.